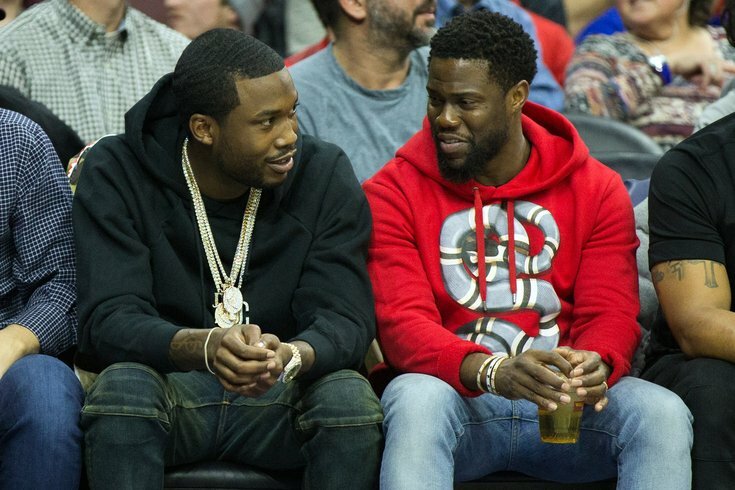 Philadelphia natives, rapper Meek Mill, left, and comedian Kevin Hart sit court side during the NBA game between the Philadelphia 76ers and the Houston Rockets at Wells Fargo Center on Jan 27, 2017. North Philadelphia native Kevin Hart believes the trials and tribulations of hometown friend Meek Mill will ultimately be a force for positive change in the criminal justice system. Approached by TMZ on Monday, the comedian was questioned about news that Philadelphia District Attorney Larry Krasner will not oppose the rapper's release on bail pending an appeal for post-conviction relief. "I think everything happens for a reason and Meek going to jail, and this story now coming out, is really going to force ... the system to do better. You know what I mean? They're not going to have a choice because you're looking at injustice at a very high level." On Wednesday last week, the District Attorney's Office filed a motion in Common Pleas Court noting a high likelihood that Meek Mill's 2008 gun and drug conviction will be reversed. The DA's office cited allegations that the 30-year-old rapper's arresting officer in the case, Reggie Graham, lied under oath during his trial. A pair of affidavits filed last month by Meek Mill's attorneys provided testimony from two former police offers who questioned Graham's credibility. The retired police officer's name was also included on a secretive list of current and former Philadelphia law enforcement officers who may have provided unreliable court testimony. The list was compiled last year under former Philadelphia District Attorney Seth Williams, who has since been convicted of corruption and sentenced to prison. Hart said he's spoken with Meek Mill several times. "His head is up," Hart said. "He'll be out soon. And when he comes out, he's going to come out better than ever. And I think now a younger generation gets to see what not to do and what not to be."